Private lessons cost US $28 to $35 per 50-minute lesson, depending on how many tickets you buy. Nihongo-Pro textbooks are available for download. Our private lessons cost US $28 to $35 for each 50-minute lesson, depending on how many lessons you buy. Just starting private lessons at Nihongo-Pro? Enroll here first, and we'll match you with one of our teachers. How many lessons would you like to buy? After that, if you need more time, you can extend unused tickets with a low-cost extension. To pay by check, money order, or electronic transfer, please contact Nihongo-Pro support for payment details. Please choose your teacher and number of lessons above. Nihongo-Pro textbooks are available for purchase as e-books (PDF files). Click one of the links below to purchase the book. In most countries, no PayPal account is needed if paying with a credit or debit card. Click a payment link below, and then click 'Pay with Debit or Credit Card' on the PayPal page. If the option is not available in your country, click 'Create an Account' on the PayPal page. Nihongo-Pro students, get a 50% discount on these books! Log in first, and the discount will be shown here automatically. 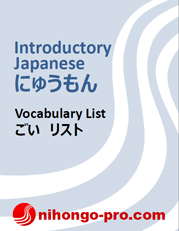 Includes vocabulary lists, hiragana and katakana charts, Japanese pronunciation tips, and more. Nihongo-Pro students, log in first to get 50% off this book. Includes the definition, usage, and model sentences (including English translations) for 130 JLPT N4 grammar patterns. 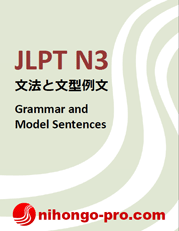 Includes the definition, usage, and model sentences for 128 JLPT N3 grammar patterns. Includes the definition, usage, and model sentences for 171 JLPT N2 grammar patterns.